‘You can’t manage what you don’t measure’ is a keystone of energy efficiency. Measuring your building’s energy use is so important that reporting it is now the law in California for many building owners. The first deadline is quickly approaching beginning on June 1, 2018. This new law requires reporting and benchmarking your building’s energy use for many building owners. Here’s what you need to know. Simply stated, energy benchmarking means comparing a building’s energy use over time to the average use for similar buildings. What does California Law have to do with energy benchmarking? With sights set on doubling California’s energy efficiency goals by 2030, Assembly Bill 802 (AB802) supports this goal by increasing transparency of energy use data. AB802 required the California Energy Commission (CEC) to create a statewide building energy use benchmarking program for buildings over 50,000 square feet (sq. ft.). To facilitate energy data sharing, utilities were required to provide building-level energy use data as of January 1, 2017 under AB802. Though this utility data sharing requirement applies only to buildings with no residential accounts and buildings with five or more utility accounts. The first deadline the CEC imposed, June 1, 2018, requires building owners to report energy use for benchmarking purposes. They must complete their energy use reporting using ENERGY STAR Portfolio Manager by the deadline to comply with AB802. Portfolio Manager is a free, online tool to measure and track energy and water use, as well as greenhouse gas emissions. You can use it to benchmark a single building or your entire building portfolio. This reporting requirement will be annual moving forward and due on June 1. Beginning in 2018, only buildings 50,000 sq. ft. or above with no residential utility accounts must report by the 2018 deadline. In 2019, buildings with 17 or more residential utility accounts (i.e. large multi-family residences) must also report. An exemption does exist and excludes buildings from the reporting requirement where more than half of the gross floor area is used for manufacturing or industrial purposes or when used for scientific experiments requiring controlled conditions such as biotech clean rooms and cutting edge computer chip labs. The following table outlines reporting requirements for AB802. Why Do they want my energy use data? Sharing your energy use data benchmarks your building, providing insight into its energy use relative to similar buildings. Besides reducing greenhouse gas emissions, California seeks to help building owners and tenants make better purchasing or leasing decisions, as well as provide insights into the buildings where they live or work. Since you must do it, you should know what you can benefit from the process. Whether you are a building owner or tenant, knowing how much energy you use reveals potential opportunities to increase the value of your building and bank account. Saving energy can both save money and increase revenue. As a tenant, renting a more energy efficient office space will obviously save you money through lower energy bills. As a building owner, if you discover your building currently has a higher energy consumption than most, you can investigate energy saving projects. This can increase revenue down the road. Research indicates commercial office buildings with increased energy efficiency or sustainability achieve higher rents, occupancy rates and sales prices (Jackson, 2009; Pivo and Fisher, 2010; Fuerst and McAllister, 2011; Eichholtz et al., 2010 and 2013; Devine and Kok, 2015). Increased building owner revenue can be attributed to several factors. Lower operating costs for tenants increases the building’s appeal. Also increasing tenant appeal and demand, research shows a potential increase of productivity with increased building quality and tenant comfort (WGBC, 2014). With employee salaries a significant operating expense, who wouldn’t want their employees being more productive? Lastly, a lower carbon footprint increases public image – ‘the feel good factor’ – and helps achieve corporate sustainability goals. Some cities are going above and beyond California’s AB802 reporting requirements. San Francisco, Berkeley and Los Angeles all have local energy reporting ordinances that exceed California’s. All of them require additional buildings smaller than 50,000 sq. ft. to report energy use as well as energy audits/assessments or retro-commissioning much like New York City’s Local Law 87. Annual benchmarks are due April 1, with an exception this year, with a due date of May 1. By submitting San Francisco’s benchmarking report, you automatically fulfill California’s AB802 requirement. How do you comply with San Francisco’s Energy Performance Ordinance? Special instructions to report 2017 may be found here which describes some additional steps required due to a software issue between PG&E data and ENERGY STAR Portfolio Manager last year. Berkeley adopted its own energy efficiency requirements with the Building Energy Saving Ordinance (BESO). It requires an energy assessment of a home or building under 25,000 sq. ft. at time of sale and has a phase-in schedule for buildings 25,000 sq. ft. or larger requiring both an energy assessment and benchmarking as listed below. The first deadline for BESO’s kicks off this year on buildings 50,000 sq. ft. and above requiring an energy assessment in addition to benchmarking due by July 1, 2018. There is a gap in due dates between BESO and AB802 reporting requirements. Though completing the BESO benchmarking report does fulfill the AB802 requirement, you would need to do so by June 1, 2018 to be considered timely for AB802. How do you comply with BESO? Los Angeles rolls out their ‘Existing Buildings Energy and Water Efficiency Ordinance’ (EBEWE) requirements for more buildings this year. Following the same deadline for AB802, privately owned buildings 50,000 sq. ft. or more must be benchmarked and disclose both energy and water use by June 1, 2018. Last year only buildings 100,000 sq. ft or more had to report. Under EBEWE, city owned buildings 7,500 sq. ft or more must also disclose this information staring this year. Beginning in 2019, privately owned buildings 20,000 sq. ft. or more must also be benchmarked. 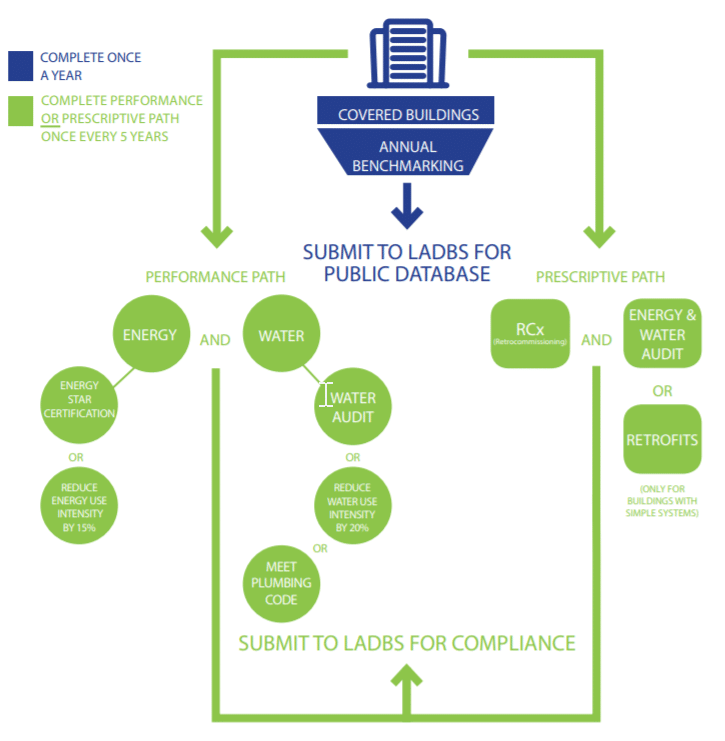 Annual benchmarking reports must be submitted by June 1 every year following their initial requirements for the applicable buildings. Also beginning in 2019, EBEWE requires covered buildings to either achieve specified energy target or perform energy audits and retro-commissioning on a five-year cycle. Ordinance requirements are shown below. How do you comply with EBEWE? How do I comply with AB802 if my city doesn’t have an energy ordinance? Now is the time to research your building’s benchmarking and possible audit or retro-commissioning reporting requirements. If an energy audit or retro-commissioning is in your future, it pays to find a reputable energy service provider. Though the lowest bid might meet your city’s requirement, you could potentially end up losing more money by missed energy saving opportunities. Though they should be, not all energy audits are equal. SF Environment’s website contains valuable links for learning about what to expect from various levels of an ASHRAE level audit and a guide to selecting a retro-commissioning provider. Also, this summer ASHRAE will publish the first ANSI-compliant standard for energy audits. You can learn more about what to expect from the standard in our blog post from the chairman of the committee – kW Engineering President, Jim Kelsey. You can use the CEC’s or your city’s online guides to navigate the reporting process. If you need any help with complying with benchmarking or energy audits get in touch. Contact us anytime, we’re happy to help. Devine, A. and Kok, N. (2015). Green certification and building performance: Implications for tangibles and intangibles. Journal of Portfolio Management, 41(5), 151-163. Eichholtz, P. M. (1996). Does international diversification work better for real estate than for stocks and bonds? Financial Analysts Journal, 52(1), 56-62. Fuerst, F. and McAllister, P. (2011). Green noise or green value? Measuring the effects of environmental certification on office values. Real Estate Economics, 39(1), 45-69. Jackson, J. (2009). How risky are sustainable real estate projects? An evaluation of LEED and ENERGY STAR development options. Journal of Sustainable Real Estate, 1(1), 91-106. Pivo, G. and Fisher, J. (2010). Income, value, and returns in socially responsible office properties. Journal of Real Estate Research, 32(3), 243-270. WGBC (2014). Health, wellbeing and productivity in offices: The next chapter for green building. World Green Building Council. Available at: http://www. worldgbc.org/activities/health-wellbeing-productivity-offices/.